Second House, covered in vines, in a photo from the Montauk Historical Society’s archives. Back when all of the East End was a wild nether land on the edge of the minds of Manhattanites, Montauk was a vast pastureland for the livestock of East Hampton’s farmers. From the 1760s to 1895, the 8,000 acres that comprise Montauk were the summer home of sheep, cattle and horses who benefitted from the cool sea breezes, the vast acres of meadows and prevalent fresh watering holes. It didn’t hurt that the entire hamlet could be blocked off by fences extending from Napeague Bay to Fresh Pond, and again from Fresh Pond to the ocean. Along that stretch of land were three houses, aptly named First House, Second House and Third House, where the shepherds and cattle hands stayed while tending to their animals. Sheep were pastured along the Hither Plains, while cattle were pastured surrounding Fort Pond. Second House, on Montauk Highway at the western edge of downtown Montauk, is now in the hands of East Hampton Town and the Montauk Historical Society, and both groups are planning to renovate the building as it was in the time that it served the pastureland. East Hampton Historic Preservation Consultant Bob Hefner presented his historic structure report on Second House to the East Hampton Town Board at a work session April 19. The East Hampton Town Trustees ordered Second House built in 1797 to house the shepherds working at Fort Pond, and eight different keepers tended the house over the course of the following century, said Mr. Hefner. In 1912, the house was remodeled as a summer cottage, and it served as such until it was purchased by the town as a museum in 1968. “It’s now closed to the public with serious structural problems and dangerously obsolete mechanicals,” said Mr. Hefner, who recommended that the additions built in 1912 be removed in order to restore the building to the time when it served its most historically significant role as a home for the shepherds, which spans the 19th Century, including a wing built in 1880 by owner Arthur M. Benson. The use of Montauk as a pasture came to an abrupt end near the close of the 19th Century. Arthur M. Benson, president of the Brooklyn Light Gas Company, bought the entire hamlet from the proprietors of Montauk in 1879 for $151,000. After Mr. Benson’s death in 1889, his heirs sold large tracts containing the best pastures to principals in the Long Island Rail Road and Standard Oil. Until that time, the keeper of the First House kept track of all the livestock entering at the first gate in Napeague. The keeper of the Second House was a shepherd, and the keeper of the Third House, now part of Montauk County Park, was in charge of the cattle and horses. First House no longer exists, but it was near where Hither Hills State Park is now. From 1797 to 1879, the following shepherds took care of Second House, where they lived, usually with their families: Christopher Hedges; John Parsons; Uriah Miller; Jonathan Fithian; Aaron Fithian; Sidney H. Stratton; George L. Lester and George A. Osborne. Their jobs were to ensure that the gate to the cattle pasture to the east was kept closed, that the cattle stayed to the east and the sheep to the west of Fort Pond, according to Mr. Hefner’s report. They were also charged with repairing breaches to the fence, driving sheep and cattle in and out of Montauk and from one field to another, and chopping wood to sell. 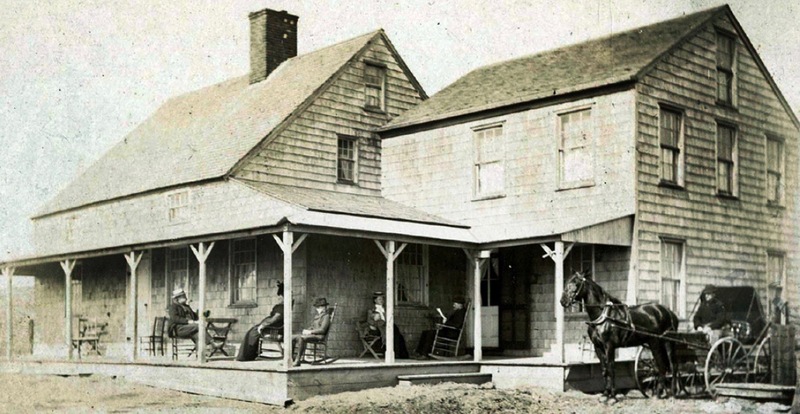 The house also took in boarders, including hired hands, sportsmen and the Town Trustees and proprietors of the land at Montauk who would hold monthly meetings among the three houses to discuss their stake in Montauk. Mr. Hefner said the next step he’d like to take is to meet with board members of the historical society to discuss the mechanical systems they’d like to see in the building. “After that, we’d prepare plans, and remove plaster and flooring to be able to see the old frame of the house,” he said, adding that some demolition will be necessary, which would require competitive bidding if done by the town, but not if done by the historical society. George Biondo of the Montauk Historical Society said that about 35 years ago, he took a trip to Governors Island to meet with the Coast Guard about their plans to close the Montauk Lighthouse. At the time, he said, they scoffed at the Montauk Historical Society’s plan to run the lighthouse. But in the historical society’s hands, he said, the lighthouse received 750,00 visitors last year. Mr. Hefner’s full report is available on the Montauk Historical Society’s website here.